• parts within an organism, which may be complex and require mutually adjusted changes in more than one of their parts (see evolution of the eye). Coadaptation suggests, but is not conclusive evidence for, coevolution. In this image the ant Formica Fusca is tending a caterpillar of the lycaenid butterfly species. 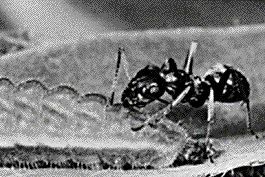 The ant is drinking honeydew, secreted from a special organ. The two species are a good example of coadaptation.